Home Tim's Adventures If Cycling Around The World Is So Good Then How Come I Just Want To Watch DVDs? If Cycling Around The World Is So Good Then How Come I Just Want To Watch DVDs? 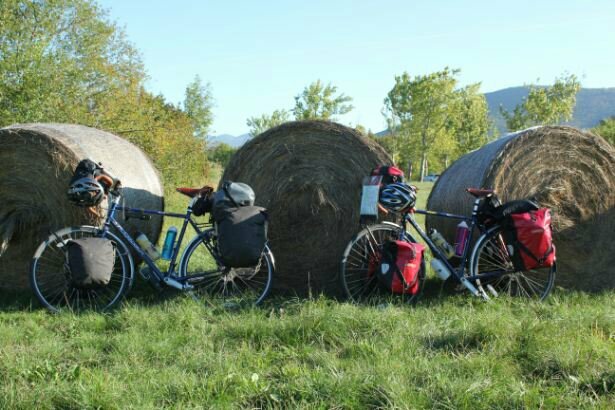 A big cycling trip is something of which I, and we, have dreamed for many years. Ever since spending three weeks pedalling through Scandinavia alone in 2009, before that listening to Alastair Humphreys talk about his four years of bike-based wanderings after work at the RGS, and even in the middle of our last big expedition – walking across Patagonia – I had to stop reading Rob Lilwall’s account of cycling home from Siberia because it was driving me mad with wanderlust. And now we are on one. 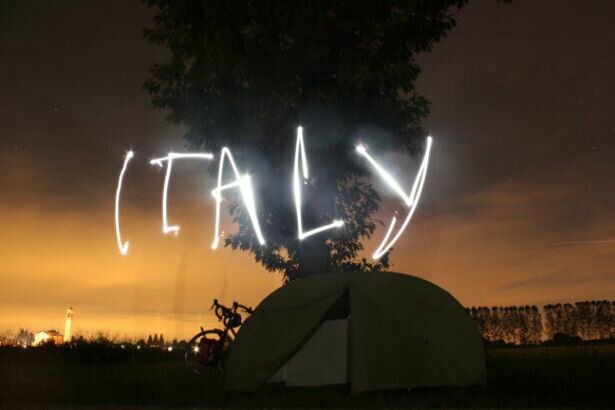 A great big cycling trip. The UK to Australia and beyond, perhaps. Few things are ever as you expect them to be in life but, whilst our 50 days on the road so far have been different in many ways from the pictures I drew in my head over the preceding years, they are not falling short of expectation. Different but just as good. 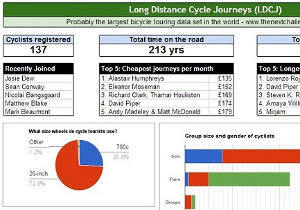 Cycling around the world – or perhaps I should restrict that to “cycling across Western Europe” for now – is great. So, why then, am I so desperate to watch DVDs? We have crossed half a dozen countries under our own steam and traversed the Alps by the same means; spent a month of nights beneath the stars, basked in the warmth of a European summer, flung ourselves into downpours of rain and swum wild whenever the fancy has taken us. We have neither the need to get up for work in the morning or many more commitments besides cycling a few miles each day (if we’re in the mood) and keeping vested interests (sponsors, family, followers) updated occasionally. In short, this is what many – myself included, perhaps, in more flippant moments – would call: “living the dream”. Which is what makes all the more confusing my continual desire to be indoors, with a shower and a bed, wifi access and, best of all, films on tap. When the clouds threaten thunder, I instantly search out shelter (and it is almost always man-made: bus stops, petrol station forecourts, unused verandas). If accommodation is on offer – a friend of a friend, a couch on which to surf, an act of kindness from a stranger – then I will down tools at the drop of a hat or sign up for a lengthy detour, whichever is required to be spared the tent and given four walls. Should we have a day’s rest in a new town my priority is not a tick list of tourist destinations but sleeping, checking my emails and watching new episodes of Breaking Bad (a well which has now run dry). These habits – indulgence? laziness? – are the exact things which I spurn at home. Sitting inside watching TV? Not Tim Moss. He’s out back doing hill reps in the dark. Lying in bed wasting time on a tablet? The Next Challenge says no. None of this is to suggest that I do not enjoy cycle touring (nothing could be further from the truth). But I think it does have a few other implications. 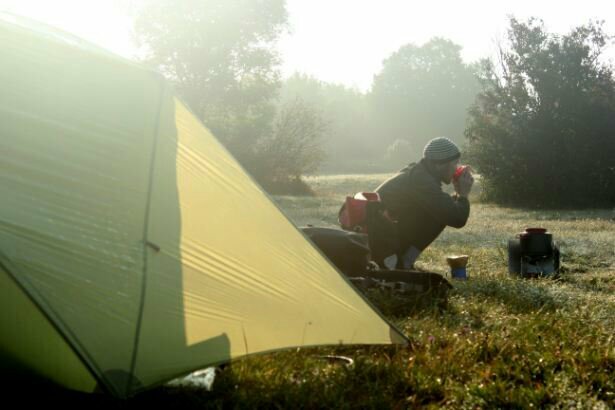 Namely that although hardship is good sometimes – indeed, unavoidable on such a trip – relief from it is always welcome; and that indulgences like mindless TV have their place (after 10 days of cycling, camping in fields and washing in streams being one particularly appropriate place). What I like most about this realisation – that even in the midst of the adventure of a lifetime all I really want to do is watch movies on my Nexus – is that it so perfectly skewers the idea of “adventurer as other”. The impression that “people like me” doing these grand adventures and waxing lyrical about our derring do through continual Facebook updates, are somehow different from other people – braver, tougher, more interesting or any other such nonsense. No. I do love cycling up hills and get a kick out of sleeping in the woods but I still like watching DVDs in bed too. 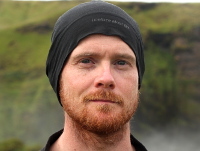 Hi Tom & Laura, finally got round to reading your blog and have started at the beginning. This post made me smile as we were exactly the same, after days and days of being outside on the road the escapism the web and tv offers is untold. We’d arrive in big cities at a hostel and other tourists would say have you visited this temple or that museum? We’d say no we’re just chilling, which meant watching back to back episodes of House and the Big Bang theory! Did you find the same with food? On the road you eat local street food or cook, but in tourist towns we would seek out pizza and chips like ‘Brits abroad’ !! Will continue reading and no doubt be filled with wanderlust once more. Thanks Liz. Glad it’s not just us! We’re probably similar with food and, for me, it’s been tea. Months drinking strong, black tea in Turkey/Iran was good cultural novelty at first but I ended up carrying my own milk powder to add surreptitiously!